Tahnee Lawson and myself visited The Rainbows Hospice earlier this year as our business, JumpStart into Primary School Dance, have chose to support the charity during 2018. We were so moved by our visit, particularly as the lady leading the tour (and working for Rainbows) was herself a bereaved parent who had direct experience of the hospice first-hand. It was incredible to see how positive and brave she was in sharing her story with us and how her experiences inspired her to start working at Rainbows. In fact, the whole building is a wonderful place. I was expecting it to feel like a hospital, but actually it was a warm, welcoming and inspiring place. It was particularly lovely to hear about the dance, movement, art and music sessions the children take part in, and the impact that it has on their well-being. I was shocked to discover that only around 15% of their funds comes from government bodies – they rely massively on donations to fund the care they give. 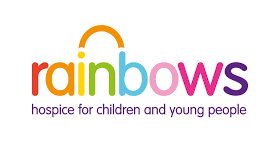 Rainbows does such amazing work, at a time when families really DO need additional support from specialists. How is JumpStart Dance supporting Rainbows this year? If you would like to sponsor me, click here to view our page on Just Giving.